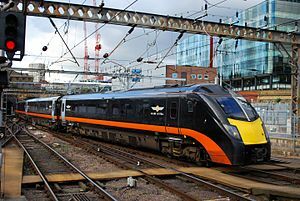 Grand Central Class 180 Adelante at London Kings Cross in 2012. Grand Central Railway Company Ltd is a privately-owned train operating company running services under the name Grand Central within the United Kingdom. This page was last changed on 15 May 2018, at 17:45.